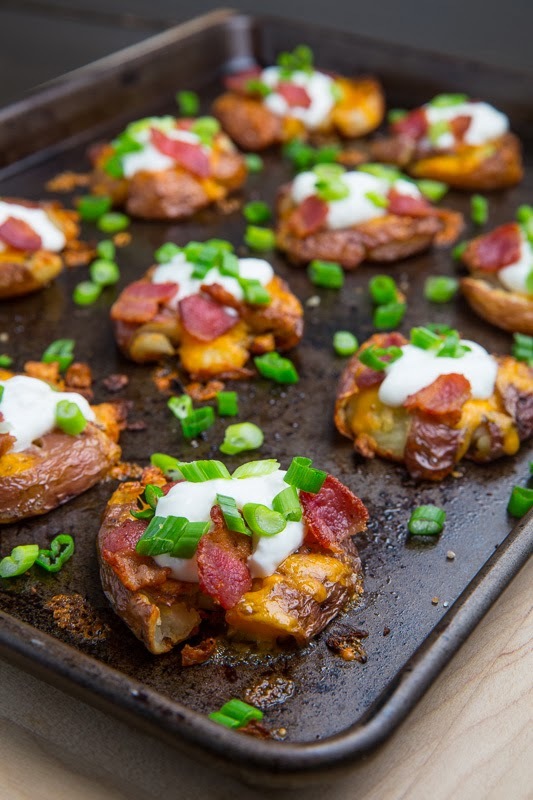 New potatoes that are cooked, ‘smashed’ and then baked until golden brown and crispy and the topped with melted cheddar, sour cream, bacon and green onions. Looking for something new to do with your potatoes? How about ‘smashed’ potatoes? 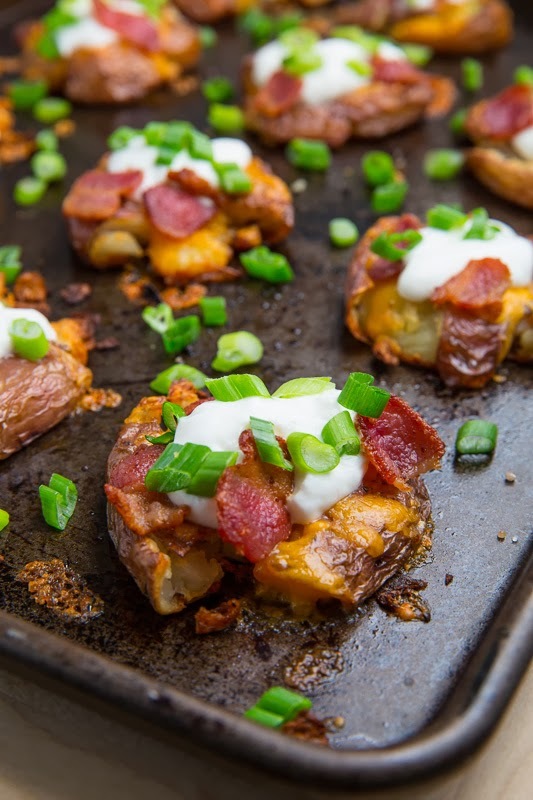 I have been wanting to try smashed potatoes ever since I saw them on Pioneer Woman and it was past time that I gave them the ‘loaded’ treatment by topping them with all of the classic loaded baked potato toppings including bacon, cheese, sour cream and green onions. The basic idea behind smashed potatoes is that you take small cooked potatoes and you ‘smash’ them, by pressing down on them with a glass or something, into thin pancakes and then you bake them until they are golden brown and crispy! There is very little that can compare with potatoes that are nice and crispy on the outside and soft and tender on the inside, think french fries, fritters, etc. and these smashed potatoes are no exception! Of course you can top smash potatoes however you like from simple things like herbs to more elaborate like these but no matter how you top them, they will disappear quickly! 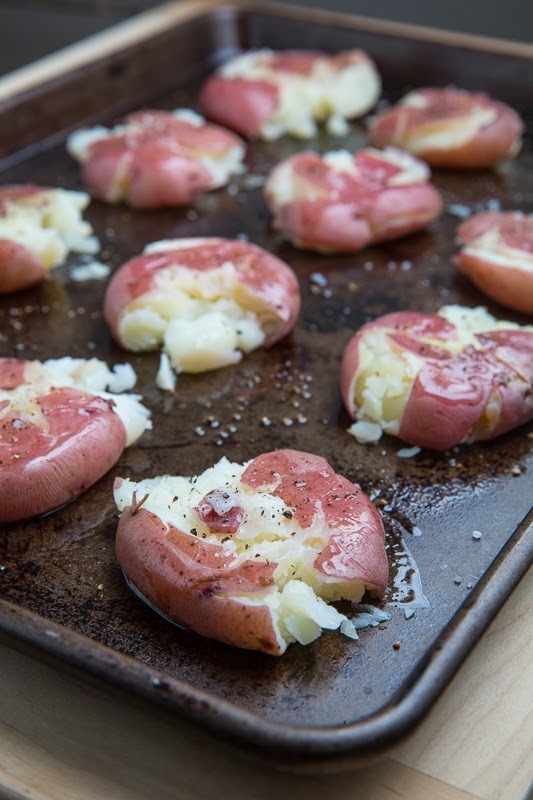 If you use really small potatoes, they work as a really nice 1-2 bit appetizer! Love fully loaded baked potato flavours? Check out below the recipe for more recipe ideas! Golden brown and oh so crispy good! For those that like broccoli on their loaded baked potatoes! Place the potatoes on a greased baking sheet and ‘smash’ them by pressing down on them with something like a potato masher, the bottom of a gloss or bowl, etc. Meanwhile cook and crumble the bacon. 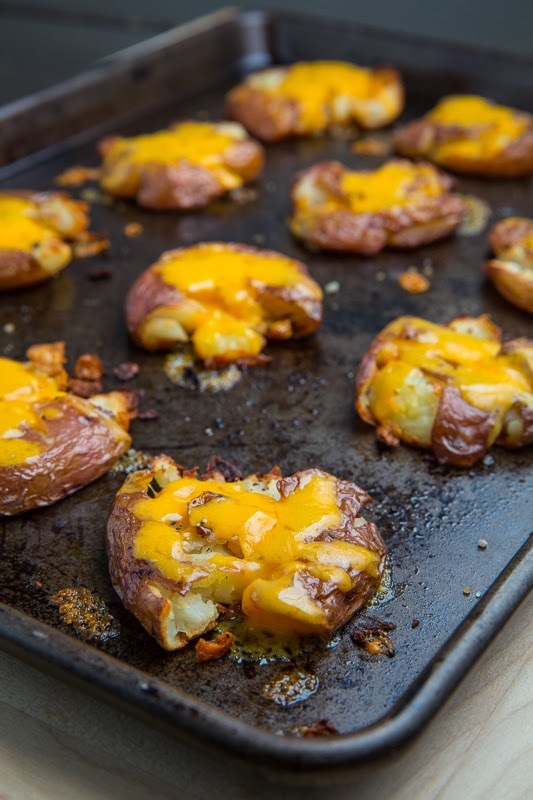 Sprinkle the cheddar onto the potatoes and optionally broil for a minute to melt the cheese. Top with the sour cream, bacon and green onions and enjoy as a side or as an appetizer! Option: Add some chopped steamed broccoli. 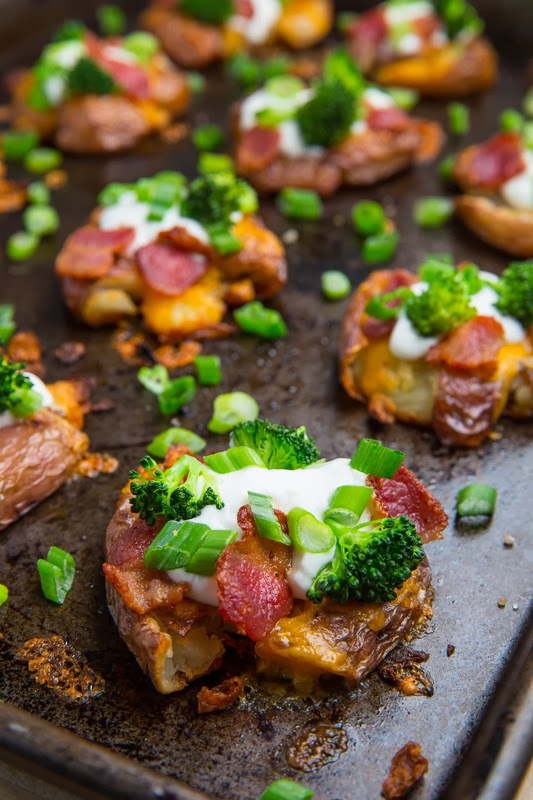 I love smashed potatoes, but these loaded ones look amazing! All that cheese and bacon. Yum! They are perfect for holiday entertaining! Great side dish, Kevin! Total Yum! Kevin, these could not be more delicious looking right now!!! You definitely make an incredible loaded potato! So delish! mmm this might make it to the thanksgiving table this year! I made these with sweet potatoes, just cut into small sizes before boiling. I saw those too, and wanted them asap. Even leftovers, cold I would eat. Ahhh, another mouth-watering recipe – love it! Can I call this dinner? Because I am. Great post, Kevin. Smashed potatoes are the best! And those toppings – seriously, how could I resist?! Ah these are making my mouth water, looks delish! LOVE these Kevin, especially with all that bacon! 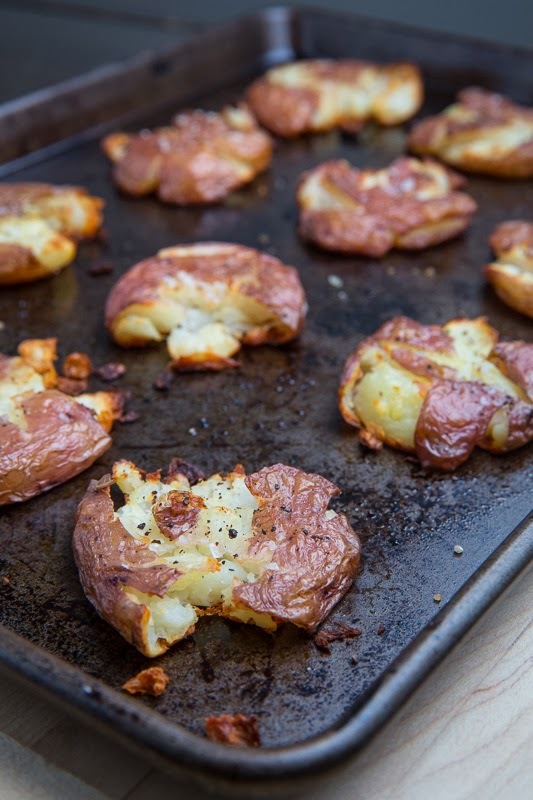 Love smashed potatoes, these are off the charts amazing! Such a great idea! I first tried smashed potatoes after ready Thomas Keller's Ad Hoc and now I'm obsessed. These would go great with wings for sure! Love this recipe. I have just shared on my blog and will be making these tonight for dinner. I am going to add broccoli and peas as well. Thank you. Can anyone tell me how to make smashed potatoes without having them fall apart into little pieces? It happens to me every time! Please and thanks!! Anonymous: I find that when you smash them, they do tend to fall apart but after you bake then the second time, especially with a bit of cheese, they firm up again to the point where you can easily pick them up and eat them as two bite appetizers. Thank you, Kevin. Love your recipes!! I'd definitely recommend smashing them with a glass and not a potato masher. I used a masher and they got stuck between the "rungs" of the masher, and I kept having to try to pry them out of the masher. DEEEEELISH! Looks like you get the flavor of Potato Skins without all the work. Oh Kevin, we just love bacon, and now with the sodium reduced products on the market we can make some of the yummy recipes you post here. Thank you for this deliciousness!